How exactly did so many of us come to be pouring highly acidic cola down our throats over and over again each day? And what kind of negative effects is this acid drink having on your teeth, stomach, digestive system and long term health? Ahead is the pH level of soda and just how acidic Coke and other popular carbonated beverages are to drink. Also, how the strange mix of sugar, chemicals and acids in cola affects digestion and can lead to some surprising gastrointestinal problems. Short of drinking undiluted vinegar, cola is about the most acidic beverage you can buy to drink, according to studies by the Journal of the American Dental Association. In testing, the pH level of the most popular brands of soda ranged from between 2.34 and 3.10. Coke was one of the most acidic sodas tested (pH of 2.37). While Pepsi cola was not far behind in acidity (pH of 2.39). Though not as high on the acid scale as cola, other popular carbonated soft drinks, like Fanta Orange (pH of 2.82), Dr Pepper (pH of 2.88), Mountain Dew (pH of 3.22), 7UP (pH of 3.24) and Sprite (pH of 3.24), all showed significant acidity when tested. In the way that the pH of liquids are ranked, a pH level of 2.5 is about 10,000 times stronger on the acidic scale than water. To get an idea of the scale of the acid in soda, by comparison, battery acid that will eat away your skin has a pH of 1. Clean water has a pH of 7 and your blood needs to maintain a pH balance of between 7.35 and 7.45 for cellular processes to function properly. When your blood has a pH below 7.35 it is considered too acidic and acidosis is associated with many health problems and diseases. While a healthy digestive tract’s buffering systems generally prevent cola’s acidity from directly affecting your blood, these countermeasures can be costly in the long term. Minerals stored in your body, such as calcium phosphate, are drawn upon by the phosphate buffering system to counteract the carbonic acid, and particularly citric acid and phosphoric acid, found in sodas. Calcium phosphate is an important component of your bones and teeth, but the more acidic soda you consume, the more calcium phosphate is drawn upon to neutralize it. It’s not just a case of there not being enough calcium to maintain healthy bones and teeth. Over time, with high consumption of acid drinks like cola, calcium can actually be drawn from your teeth and bones to compensate your depleted digestive system. When this happens your teeth become weaker and more likely to decay, your bones become more brittle and easier to fracture and the eventual result can be crippling osteoporosis. 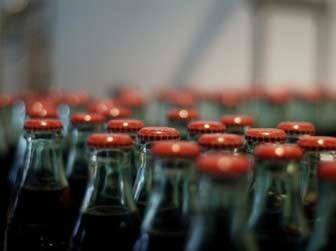 This study of over 25,000 people suggested cola consumption specifically, rather than just carbonated drinks in general, is directly related to an increased risk of osteoporosis. Your mouth lining, throat and esophagus are all very sensitive to acids like phosphoric acid and may become irritated with regular exposure to cola. But what about your stomach? Some people believe that because the hydrochloric acid in your stomach is of a lower pH, at around 2 and less than soda’s pH of 2.37, its acidity should have no effect. Unfortunately, high consumption of soda, with both its phosphoric acid and caffeine, appears to reduce the secretion of HCl in your stomach over time. This is likely due to the regularly elevated gastric acid production that drinking cola, particularly on an empty stomach, encourages. While many people worry about too much stomach acidity, it’s often chronic low stomach acid that is more problematic for digestive health, negatively affecting protein digestion in particular. Mineral absorption is also impaired with low HCl. But even more relevant in the case of digestive problems, reduced hydrochloric acid in gastric juices can allow potentially dangerous bacteria, yeasts and other parasites in food to survive the stomach where they are normally neutralized. These pathogens are then free to move on to your small intestine and colon where they can end up causing all manner of gastrointestinal problems and long term health issues. Excess liquids alone can dilute stomach acid, which is bad enough for digestion. Add the phosphoric acid, caffeine, massive quantities of sugar and the various chemicals in soda to the mix and you are really tempting serious digestion problems. All of this is assuming you have a healthy digestive system in the first place. Many people report stomach pain after drinking soda and doctors generally advised against drinking soft drinks of any kind when you have an irritated stomach or stomach ulcers. Good advice, but probably a bit too late by then. Replace cola now with these healthier soda alternatives and you may avoid ever having these problems in the first place. Even better, you’ll be likely to lose weight, be much healthier and regain some real energy that doesn’t rely on that jittery caffeine rush and insulin provoking sugar spike and crash. Have you ever tried giving up cola? It seems the specific ingredients in soda, especially the caffeine, high levels of sugar and very acidic pH, make it particularly hard for many people to stop drinking it. I’d be interested to hear about your experiences, especially how you felt in the days immediately after giving it up. It’s not really a question of is soda acidic, but rather, just how much damage is the acidity in cola doing to you and your body personally. Ahead is a simple plan to quit soda and its acids, chemicals and sugar by replacing it with a similar tasting but much healthier drink and minimizing caffeine withdrawal symptoms.